Download the Latest Apps for Windows 10! In all circumstances Number 9 Creative dba Nibbler Apps’ maximum liability is limited to the purchase price of the products sold. Nibbler Apps shall not, under any circumstances, be liable upon a claim or action in contract, tort, indemnity or contribution, or other claims relating to the products it sells which exceeds this liability limit. Nibbler Apps shall not be liable for third party claims for damages against the customer, or for malfunction, delays, interruption of service, loss of business, loss or damage to exemplary damages, whether or not Nibbler Apps has been made aware of the possibility of such claims or damages. An order is not binding upon Nibbler Apps until it is accepted; Nibbler Apps must receive payment before it will accept an order. Payment for product(s) ordered is due prior to shipment. Customer can make payment by Paypal. Any dispute arising out of or related to these Terms and Conditions or the sales transaction between Nibbler Apps and Customer shall be governed by the laws of the State of Minnesota, without regard to its conflicts of law rules. Specifically, the validity, interpretation, and performance of this agreement shall not be governed by the United Nations Convention on the International Sale of Goods. Nibbler Apps and Customer consent to the exclusive jurisdiction and the exclusive venue of the State Courts of the State of Minnesota, Scott County, to resolve any dispute between them related hereto, and the parities waive all rights to contest this exclusive jurisdiction and venue of such Courts. Finally, the Customer also agrees not to bring any legal action, based upon any legal theory including contract, tort, equity or otherwise, against Nibbler Apps that is more than one year after the date of the applicable invoice. Download our app today for an easy fix to auto-hide the Taskbar on your Windows 10 tablet! 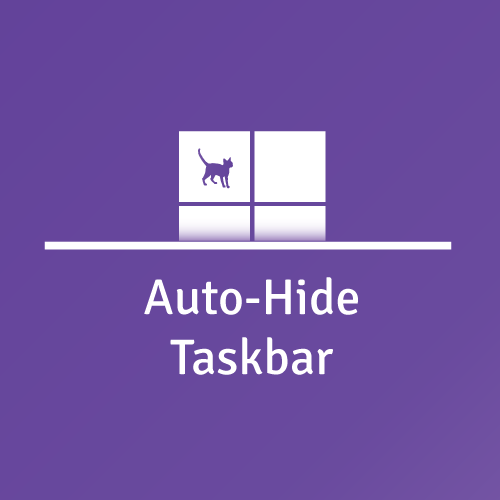 Auto-Hide Taskbar for Windows 10 Version 1.1.1.0 Now Available!